Do authors need to spend lots of time describing the hamburger their main character is eating? The juicy delight of a succulent tomato sandwich? The cool refreshment of lemonade? How much is too much? In other words, if it shares something about the character, then authors should use food to help with that description. A robust character, who loves to eat and sits down to wonderful meals, delights the reader. The best example of that is in the Detective Montalbano series by Andrea Camilleri. Salvo looks forward to his lunch and dinners and describes their taste, smell, texture with gusto. It’s all related to his character and his relationship to other characters. He never talks while he eats because talk gets in the way of the pleasure of eating. My imagination takes me to his patio off his house on the sea with him sipping a glass of red wine and eating the delicious Pasta alle Vongole while gentle waves wash on the shore. If not, skim over it. Why discuss an entire meal and what they ate if it tells the reader nothing? Fill in the blanks about the character. As I described above. The food in the Montalbano series is nearly as important as the events of the murder. Rarely does anyone interrupt the detective while he’s eating. If someone does, it must be very important. If he leaves a good meal because of some event, idea or instinct, it must be life and death. The reader knows this because Camilleri prepared us for it. Tell the reader more about the character. Food not only tells us what the character eats but what the character likes to eat. How about a character who has no food in the house? Or one that loves to shop in the open market? The fact the character has no food suggests he or she doesn’t spend much time cooking. Eating isn’t important. The reverse is true of the character who shops for the best potatoes in the farmers market. A character might shun sugar products because he or she is diabetic. Perhaps that’s a clue? A character might eat a lot of carbohydrates because he or she is planning on running a marathon. Is this characteristic of this character or a clue? Tell the reader about the mood of the story. We all recognize a romantic dinner with candlelight and a bottle of champagne. Those items set up the mood for the evening. But imagine a lunch meeting with your boss and being so nervous you cannot eat. You order food that matches that feeling. Perhaps the place where you meet is crowded with people or as empty as a tomb. All those decisions describe mood. Barbara Pym did a beautiful job of describing mood in Excellent Women. The meal matches the mood, often dreary. Her main character, Mildred, is rather dreary as well and her larder usually contains no more than a stale cake or a slice of bread. Suggest characteristics or personality traits of the character. In my current work in progress I describe a character suffering for Attention Deficit Disorder. When she sits down to eat with a rather neat, compulsive detective, her food disappears so fast, he’s astonished. He eats as deliberately as a “snail” according to his fellow policeman. In these instances what is even more important than the food way the characters eat. The cultural habits of the time. In most English books, the characters are enjoying afternoon teas. In the Swedish mysteries, the characters eat hearty stews and lots of coffee. American books are full of fast-food eating. All these types of eating habits and the food choices give the reader a feel for the culture. As writers it’s important of us to share those morays with our readers. In later years our descriptions might be all that’s left to describe the way we lived in the 20th and 21st Centuries. These are some ways that writers can use food to help make their characters and their stories more colorful. Don’t just say the character ate lunch. Tell us what they ate, how they ate that lunch, who they were with. 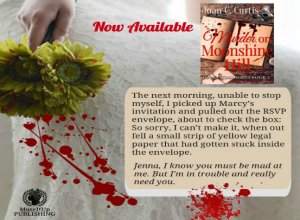 Put some meat on the lunch plate to make it more palatable to the reader. 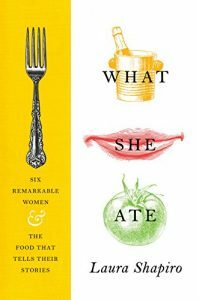 While you’re at it, check out my review of What She Ate by Laura Sapiro. That book uses food to help us understand six historical characters. See how food played a role in the development of those people and the decisions they made.